He’s going to get quite a test for his stakes debut in the Fountain of Youth. Not only does he have to contend with a 13-horse field, he drew post 12, so his best case scenario is to take way back, drop in, and hope he can make his way through or around all those horses. He tuned up for the race with a maintenance breeze in :50. Let’s face it, he’s going to have to get lucky, and with only one more stakes start after this, he better get some luck if he hopes to start accumulating enough points to get in the Derby. It’s February and he still has big fat goose egg, so it’s time to put up, bad post and big field or no bad post and big field. McLaughlin was happy with his :48 3/5 breeze, although this work is just a minor step toward the Florida Derby (gr. I) and his first start in nine weeks. I fear I will run out of things to say about him every week in that long a time. As one can plainly see, I already have, except to add that the Speed Sheets apparently are playing a major in his R&R period on the Derby trail. As I also have said, if you like the horse, you have to feel good it’s at least McLaughlin who is attempting to pull off the fresh horse approach. He’s had success at it before and he is dealing with a talented horse with a good amount of bottom. Sadler might have had a few moments of jockey anxiety when Bayern came rolling down the stretch in isolated splendor, but at this point, Candy Boy is more advanced and battle tested in classy company. But only Bob Baffert knows how Bayern stacks up against Chitu, who was narrowly beaten by Candy Boy in the Lewis. It’s still a long way off, but it’s always intriguing to ponder the choice: The proven, classy stakes horse or the unproven dynamo who could be something special? Gary Stevens just has to hope he doesn’t land on any more gifted 3-year-olds (that was a joke). Under the circumstances, things couldn’t be going any better. He worked 3 furlongs in :35 3/5 and also was caught a half in :47 3/5, galloping out a solid 5 furlongs. McGaughey won’t rush him into the Gotham (gr. III) and likely will wait a week for the Rebel (gr. II). Oaklawn hasn’t exactly been a common watering hole for McGaughey’s 3-year-olds, but timing is what’s important and a Rebel-Arkansas Derby (gr. I) double should have him ready for the first Saturday in May. With his strong foundation, he shouldn’t need more than that, especially if he can get a good stiff race in one of them. Because of his come-from-the clouds style in his first two races, that Remsen barn-burner was much needed to show his versatility and willingness to fight and come back from certain defeat. Yes, I’m well aware he didn’t beat much in his allowance procession, but sometimes it’s not who you beat, but how you look doing it, and this colt reminded me of Big Brown in his first two wins, in that the performance seemed out of the ordinary; that maybe you were looking at something special in the making. To win by 15 lengths under a hand ride and come home in :11 4/5 and under :12 1/5 is pretty impressive no matter who is behind you. Now, here’s the kicker: he wasn’t even my top Baffert horse. Hoppertunity is the horse that has captured my imagination, but unlike Bayern he has yet to beat winners, and he needs to step up in the Risen Star Stakes. But for now, Bayern has everyone excited and rightly so. But can he end the Apollo curse? Interesting early decision for Gary Stevens, but it’still hard to go off the more proven Candy Boy at this point. I have to admit I was skeptical about his Kentucky Jockey Club (gr. II) victory, considering he was a maiden, and others coming out of that race didn’t run well, but he proved he’s a top horse with his authoritative victory in the Southwest Stakes (gr. III), drawing clear of Strong Mandate with a final sixteenth in :06 1/5. And Strong Mandate was 6 lengths ahead of third-place finisher Ride On Curlin. In addition, this colt’s actual birthday is Derby Day, the Winchell family owned his sire Tapit and broodmare sire Olympio, and Asmussen is eligible for the Hall of Fame this year, so perhaps the stars are aligning the right way for all involved. His pedigree can go either way, with a combination of speed and some decent stamina. We know he’s a fighter, and now he just has to demonstrate his class in stakes company and show he can beat Top Billing at equal weights. He had a far better trip the last time they met, and most likely will have a better trip in the Fountain of Youth, but the rail is always tricky, and you can bet Pletcher would love to see him get to the outside. John Velazquez, who rode him two races back, will replace Jose Lezcano. He seems to be in top physical condition, and like Top Billing, just needs to start collecting some points, with only one remaining start after the Fountain of Youth. Not crazy about post 10 in Saturday’s allowance race against a stakes-quality field. Had his most impressive work to date, going 5 furlongs in 1:00 3/5 in company with Intrepid Citizen. Without blinkers, he sat 5 lengths back and ran down his workmate with a :35 1/5 final three-eighths, coming home his last three eighths in :11 4/5, :11 4/5, and :11 3/5. Followed that up with a :49 1/5 breeze, coming home in :12 1/5 and :11 4/5. The Team Valor team feels he probably is more of a Belmont Stakes horse than a Derby horse, so make of that what you wish. He’ll still get his chance at Churchill Downs, and no one has told Mexikoma he’s more of a Belmont horse. His upcoming preps will dictate where he stands as a Derby horse. Breezed 5 furlongs in 1:01 1/5 for his big test in the Risen Star, but received a bad break drawing post 14, which is not where you want a horse with his tactical speed. If he’s as good as he’s looked in his last two starts he will have to show it Saturday to overcome his post. He is one of many top 3-year-olds who drew poorly next weekend, but he at least has the long stretch and with most of the speed down on the rail, he could come away unscathed with a clean break and a little bit of luck. Look for Rosie Napravnik to hustle him out of the gate to get position. If he should beat this quality field from that post, then the sky’s the limit. When you see a tough, classy, consistent horse like Tamarando come off a shellacking at the hands of California Chrome and win the El Camino Real Derby with another of his patented stretch runs, you can appreciate just how good a horse California Chrome is. He had his first work back since his romp in the Cal Cup Derby, drilling a half in :47 4/5 at his new home, Los Alamitos. This colt continues to become more and more intriguing, and he just needs show this same kind of brilliance in open stakes. It’s time to start thinking points, and he has the San Felipe and Santa Anita Derby. He’s been a forgotten horse since winning Gulfstream Park Derby, but the horse he out-dueled, Wildcat Red, came back to romp by almost 5 lengths in Hutcheson in 1:22 1/5. He has run big every time and keeps showing significant improvement. He’s versatile with a stout female family and began his career with a powerful move nearing the head of the stretch to sweep past everyone, winning by almost three lengths over Keeneland’s Polytrack. Switched to dirt and with blinkers added, he got cooked in a :45 2/5 half, dueling on the lead, and finished a game second to the top-class Conquest Titan going a mile. In the Gulfstream Park Derby on New Year’s Day, he laid just off a fast pace and then out-dueled Wildcat Red to the wire, winning by a head in 1:35 4/5. General a Rod, who more than enough stamina in his pedigree, has had his Beyer figures increase from a 65 to an 81 to a 92. Trainer Mike Maker thinks a great of this colt’s ability, and he just may surprise a lot of people next Saturday. The Risen Star will be his make-or-break race and he drew well in post 9. All these thirds and fourths are fine as stepping stones, but at some point he has to start showing more, and that means sustaining his run, which has been impressive. But he has to show more punch in the final furlong. The Fair Grounds stretch should help him, as should getting away from speed-favoring Gulfstream. He’s shown the kind of steady progress you want to see, and he’s demonstrated a good turn of foot, but now it’s time to knuckle down and make some noise. He tuned up for the Risen Star with a solid half-mile breeze in :48 3/5. It was tough taking STRONG MANDATE off the Top 12. It wasn’t the sound defeat that was troublesome, as he lost a lot of ground early and had every right to get a little tired. But he was a mess down the lane, switching back to his left lead and drifting all over the stretch. You just never know what you’re going to get from this horse with each race. He’ll need to show more professionalism and take a big step forward next time out to get back among the top echelon 3-year-olds. There is no doubt the talent is there. As for the removal of SHARED BELIEF and CONQUEST TITAN, the former is in limbo right now, and with no one knowing if he can make it back for the San Felipe, there is just too much happening on the Derby trail to keep him on and occupy a valuable spot. If he has no more setbacks and indeed does make the San Felipe, then we’ll have our Derby favorite back again. We really don’t want to lose this horse, but Hollendorfer is not going to push him. Conquest Titan has been my live longshot for quite a while, but he didn’t show up for the Fountain of Youth, for which he was intended, as he reportedly had lost some weight and will wait for the Florida Derby, putting him in the same position as Cairo Prince with the exception of the weight loss. We have no idea how much racing he can take, so that is a question mark. I still like the colt a lot, but again with so much activity around the country, I'll just put him off to the side for now. This weekend will see numerous changes on everyone’s Derby list. Now that we saw Bayern rocket onto the Derby Dozen, what should we expect from HOPPERTUNITY, who is regarded right up there with Bayern in the Baffert stable? We featured this colt last week and he’ll get his chance to make his own splash when he journeys to Fair Grounds for the Risen Stakes. He continues to train well, breezing 5 furlongs in 1:00 3/5. I really like this colt, and if he can overcome his lack of experience against a tough 14-horse field of stakes horses, I feel he has a bright future and am looking for a big effort on Saturday. Among those he’ll have to face are fellow California invader BOND HOLDER, a grade I winner who has been training brilliantly for Doug O’Neill; RISE UP, runaway winner of the Delta Jackpot who is coming off a bullet :47 3/5 work; GOLD HAWK, who could be the sleeper in here at a generous price; ALBANO, runner-up to Vicar’s in Trouble in the LeComte; COMMANDING CURVE, who has been training well since breaking his maiden at Churchill Downs; and, of course, two horses in the Top 12 – Vicar’s in Trouble and Intense Holiday. So, as you can see, this is a very tough race that is going to eliminate a bunch of Derby hopefuls. Has everyone, including myself, been premature in dropping WICKED STRONG or did he just have a very off day in the Holy Bull and is just waiting to bounce back into Derby contention? I was thinking seriously of putting him No. 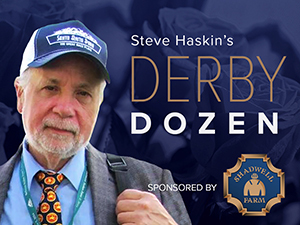 1 in the first Derby Dozen off his excellent third in the Remsen until his clunker at Gulfstream. But he’s come back with two big works, the last being a bullet 5-furlong breeze in 1:00 1/5. All of a sudden, I’m anxiously awaiting his next start in Saturday’s tough allowance race to see just where this promising colt stands on the Derby trail. If he can make amends he most certainly will leap up to or near the top of the list. The good news is that he’s back in action, but over the same track he flopped on in January. He will have to find a good spot breaking from post 9. To show how tough a race this is, he’ll have to face Mexikoma, who is in the Top 12; TONALIST, who has been hovering just above the Top 12 for several weeks and who could emerge as a major player; and two highly regarded Pletcher maiden winners MATTERHORN and CONSTITUTION. Questions in the Fountain of Youth: Can WILDCAT RED stretch out successfully to two turns? Is ALMOST FAMOUS ready for a victory to continue his pattern of first, fourth, first, fourth? Will blinkers off help CASIGUAPO, who always has a sneaky good race in him when you least expect it? Will WE MISS ARTIE handle to dirt well enough to make his presence felt? TAMARANDO and KOBE'S BACK both scored impressive victories over the weekend. You have to admire Tamarando for his consistency, his potent stretch kick, and his ability to handle distances from 5 furlongs to 1 1/16 miles on dirt or synthetic. He's the kind of horse you love having in your barn. In the El Camino Real Derby, he ran down a very nice horse in DANCE WITH FATE after going 5-wide turning for home. Kobe's Back rebounded big-time from his dismal effort in the CashCall with a stunning 5-length romp in the seven-furlong San Vicente in a sprightly 1:21 4/5, stamping himself as not only a worthy back-up for Candy Boy, but a legitimate contender himself. Dance With Fate is another you have to admire. He's finished first or second on dirt, grass, Polytrack, and Tapeta and has run big on the front end and coming from 10th. Bob Baffert worked the Robert B. Lewis runner-up CHITU a half in :47 4/5 and put MIDNIGHT HAWK back in action after his disappointing third in the Robert Lewis, working the gray 5 furlongs in 1:00 4/5. If you have doubts about SAMRAAT’s stamina, be aware that he has four links to Hail to Reason, is 6x6 to Ribot and 5x6 to Buckpasser, so although there is a good deal of 1 1/8-mile breeding and his tail-female line is pretty obscure, there is at least a foundation for stamina. Speaking of Samraat, we don’t know if My Meadowview Farm’s other 3-year-old NOBLE CORNERSTONE’s poor effort in the Sam F. Davis can be attributed to a dislike for the Tampa surface, but for what it’s worth he did come back with a sharp :59 4/5 breeze at Gulfstream. Samraat’s budding rival, UNCLE SIGH, will get the services of Corey Nakatani. HAVANA, one of the most gifted 3-year-old in the country, is up to a half-mile in his breezes, but considering he’s heading for the 7-furlong Swale, the chances of him being ready for the Derby appear slim. That doesn’t mean he’s not still pointing for it, but realistically do they really want to rush him off one sprint and one two-turn race? HARTFORD, Pletcher’s other horse playing catch-up, breezed 5 furlongs in 1:01 1/5. Pletcher had the remainder of his 3-year-old brigade on the Palm Meadows track for workouts on Sunday. In addition to his Derby Dozen horses Commissioner an Intense Holiday, he sent out Sam F. Davis winner VINCEREMOS for half-mile breeze in :49 1/5, Sam Davis runner-up HARPOON a half in :48 breezing, MATTERHORN a half in :48 3/5, and WE MISS ARTIE a half in :48 breezing. The last two will see action on Saturday. Undefeated Futurity winner IN TROUBLE continues to train sharply, breezing 5 furlongs in a bullet :59 1/5. He is another who is way behind.